Interesting and amazing that science can deduce so many facts about places millions and billions of miles and indeed, light years away. Sure, we have more to yet, learn, than we already have, but that what drives so many curious minds to careers in science. Smart people with above average IQs make good scientists. Bad science is out there, but it is usually performed by scientists for hire by wealthy Oil or business interests, trying to deceive the public and muddy the waters of understanding and real truth. Shameful and dangerous, these sham artists do a criminal thing. Fool us into thinking all is well with Earth's climate, profit is good, and money trumps reason. The richer you are the more honest? Usually the opposite is true. Big money is only concerned with making more money, not doing the right thing for our environment. Astronomy is a great hobby and Vesta can be seen by amateur sky watchers with the right tools. Telescopes reveal much, even in this light polluted age. Science has had this problem since science was invented. It all irons out in the end. Private industry is made up of the same people who make up society and government, ie. you and I and Oliver. And, no Paul, most research paid for my private industry isn't tainted. Any more than any other research where egos and personalities may become more important that the truth. Bureaucrats, businessmen and scientists are only human after all, and are subject to the same frailties as the rest of us. I'm going to guess that the large impact on Vesta occurred during the LHB, 4.1-3.8GYa. Bad science for cash can also skew data and continue the man made global warming theory. You can actually link an article about an asteroid to global warming? Hard to believe. This little gem in the first paragraph. Tells me that this entire piece is nothing but fiction. Why are they comparing a lump on an asteroid to a mountain on Earth. They are completely different formations. The asteroid is not a planet therefore can be ANY shape, lumps are just lumps. Nothing special about it whatsoever. Actually, Vesta is special. It is gravitationally bound, meaning that it is a composite of many small parts held together by gravity, just like the Earth, Moon and Mars. Vesta is a layered body that formed just like a planet. I think you mis-understand how large it is. A person could not launch himself off of Vesta under his own power, like you could on Phobos, for example. You might be able to jump really high on Vesta, but you would still fall back down. 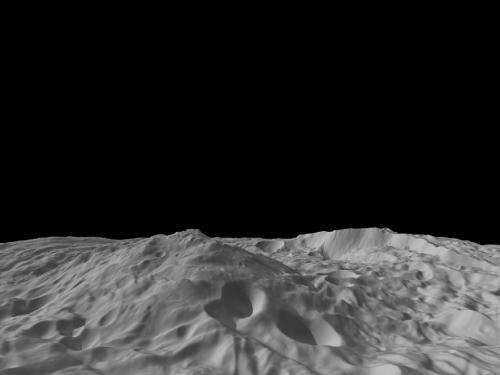 Vesta actually has geological features from when it was active; rifts, volcanos, mountains, etc. Escape velocity on Vesta is about 783 miles/hour, fyi.